"Ah, beautiful day. Blue skies. Large caliber weapons. I love getting out of the office." Sony Pictures has released a third official trailer for the dark thriller Sicario: Day of the Soldado, the sequel to Sicario, Denis Villeneuve's intense thriller set along the US-Mexico border. Josh Brolin and Benicio Del Toro return to star in this one, which looks like it has more action and even more intensity than the first film. In Soldado, the drug war has escalated as the cartels have shifted to trafficking terrorists across the border. Del Toro seems to take the lead as the point man running the latest intrusion into the cartel scene in hopes of cleaning it up. Also starring Isabela Moner, Jeffrey Donovan, Manuel Garcia-Rulfo, and Catherine Keener. This is looking very good, but it's an easy sell with all the action and Brolin being badass as always. You can still catch the first teaser trailer for Sollima's Sicario 2 here, or watch the second official trailer. 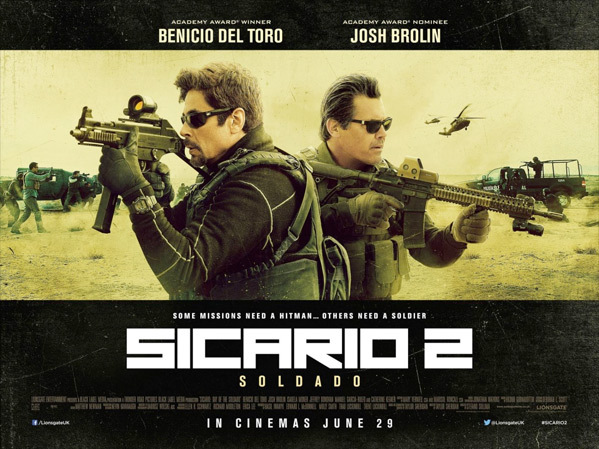 A follow-up to the 2015 film, Sicario, which centers around the escalating war against drugs along the border of the United States and Mexico. Josh Brolin and Benicio Del Toro are back as C.I.A. agent Matt Graver and his "man on fire" Alejandro. The drug war has escalated as the cartels have shifted to trafficking terrorists across the U.S.-Mexico border, and that's when Matt’s bosses ask him to intervene. Soldado is directed by Italian filmmaker Stefano Sollima, of A.C.A.B., Suburra, and the "Gomorrha" TV series previously. The screenplay is once again written by Taylor Sheridan (of Sicario, Hell or High Water, Wind River). Sony will release Soldado in theaters everywhere starting June 29th this summer. Thoughts?